Sufficient brightness LED: Using 16 million colors,High brightness SMD5050 led strip light , 150leds Top LED is perfect for lighting. High quality:Equip IC and fuse.IC,Automatically adjust the voltage and current, reduce circuit losses, protect the lamp beads, to extend the using life. 4key controller contained a DIY fuction ,:Press "DIY" botton and then just long press one of the arrow button to set it.Also it have dimming and brightness control. 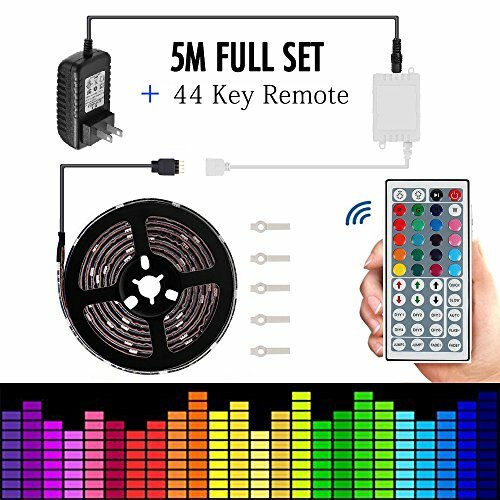 Wide range of applications:Multi-color Strip Lights with 300 waterproof 5050 RGB SMD LEDs with dimming and brightness controls, suitable for indoor outdoor lighting and decor. Such as kitchen, under cabinet, dining room, bedroom, garden, patio, balcony, party, wedding etc. 44key controller contained a DIY fuction ,:Press "DIY" botton and then just long press one of the arrow button to set it.Also it have dimming and brightness control.